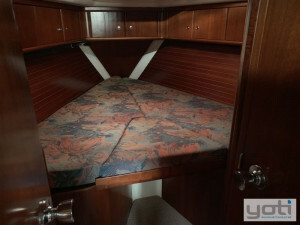 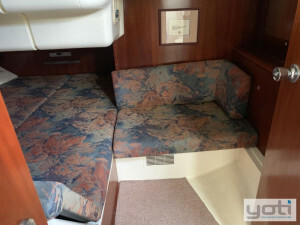 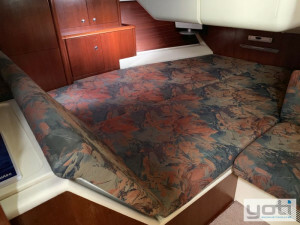 Wistarie is a 1996 Moody S38 that is listed exclusively for sale with YOTI Pittwater. 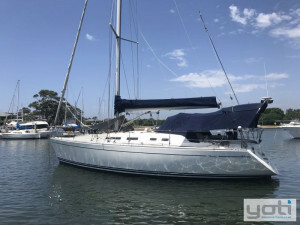 This is a single owner yacht launched in 1996 and is now offered for sale for the first time by her experienced owners. 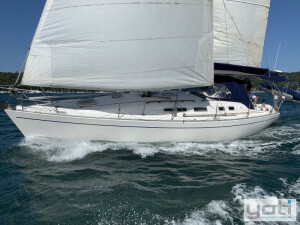 Wistarie represents a rare find on the Australian brokerage market due to her history, condition and pedigree. 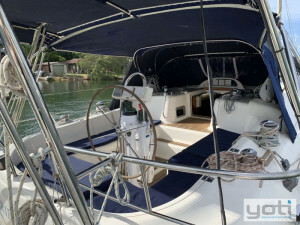 Designed by Bill Dixon and built by the hugely respected Marine Projects Plymouth, this is the only aft cockpit Moody 38 in the country. 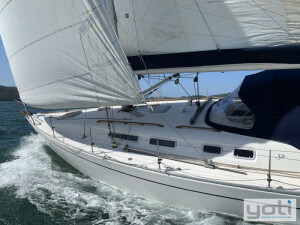 The ‘S’ model gives a taller fractional rig and deeper keel than her centre cockpit sisters – make no mistake, this is a swift cruiser designed to cruise and race in serious comfort with impressive performance. 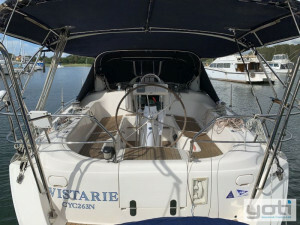 Wistarie is the two cabin owner’s version which provides a good sized forward cabin (which would normally be big enough for an owner’s cabin) plus a seriously big double aft cabin with private access to the larger of the two heads on board. 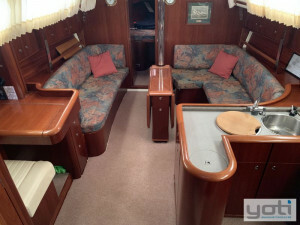 The internal woodwork is stunning and the layout is spacious and practical. 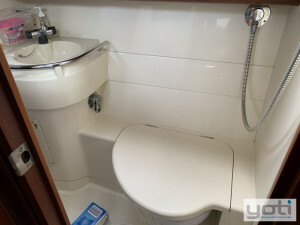 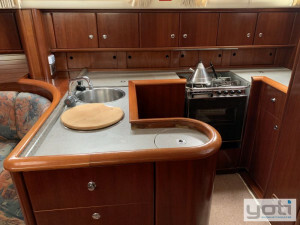 A proper ‘U’ shaped sea-going galley sits to starboard and features modern facilities – double sinks, good sized refrigeration and ample storage. 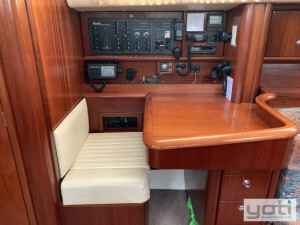 The nav station and switch board to port would satisfy the most experienced navigators. 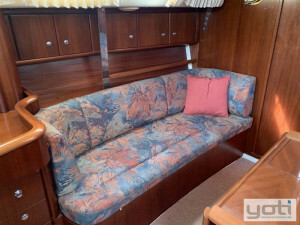 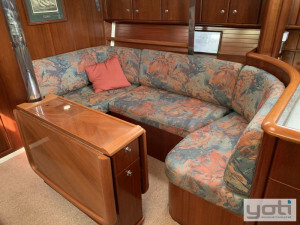 The saloon seating offers two single berths and a sturdy, central dining table with folding leaves. 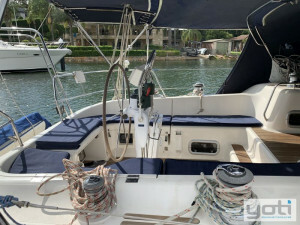 Working sails include #1, furling #2, #3, #4 and storm jib. 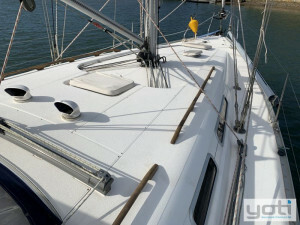 There are two kites, a cruise laminate mainsail by Hoods plus a trysail which can be hoisted on a separate track. 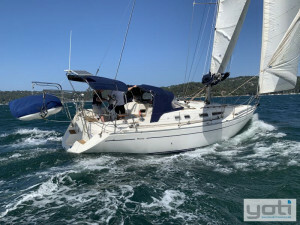 Electronics include auto-pilot, instrument displays at the helm and on the coach roof, and both VHF and HF radios. 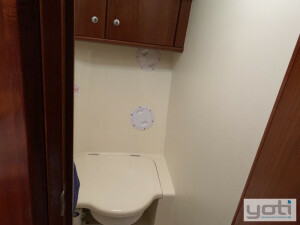 House batteries have just been replaced and the safety inventory is solid. 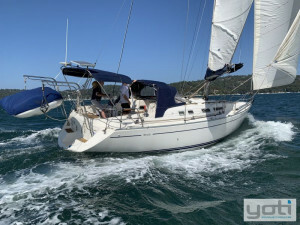 Standing rigging has been replaced new in just 2018. 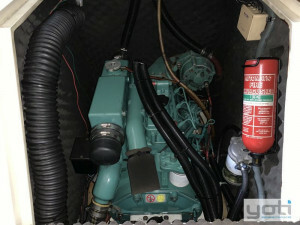 There are removable stainless steel dinghy davits plus solar panels and the cockpit is well protected via the bimini, dodger and infill system. 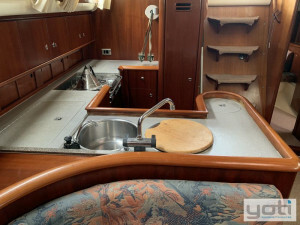 Wistarie has been set up and used for exactly what her designer planned – quick family cruising and competitive racing. 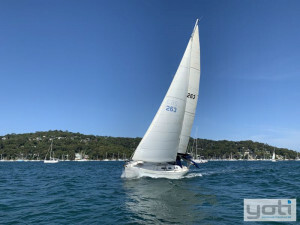 Contact Peter Mactier at YOTI for further details and to arrange inspection on Pittwater.